I am looking forward to chairing our second alumni-student mixer and hope that you will join me, the PA3, Paula Chow and the Davis International Center at a reception on Friday, May 8, from 7 to 10PM at 81 Prospect Ave (formerly known as Stevenson Hall). The reception is after dinner, but light food and drinks will be served. Over 80 alumni, students, faculty and staff attended our first event last November, which helped interested students and alumni pair up to discuss externships, careers, and jobs. The event was so successful that the students and alumni asked us to do it again! Our Spring mixer will be casual and conversational. Students and alumni will participate in small discussion groups to talk about coping, careers, academic pursuits, life after Princeton, and networking. Both graduate and undergraduate students have been invited to the event, so I am sure that the student's needs and questions will be varied and interesting. Our honorary guests at the reception are George Bustin '70 (visiting lecturer Woodrow Wilson School, Chair Princeton Alumni Schools Committee-Europe) and Satomi Chudasma (Assistant Director Princeton Career Service). Each will be sharing a brief talk on international affairs and networking. Afterwards, students and alumni will have a chance to mingle and talk to each other and our distinguished guests. 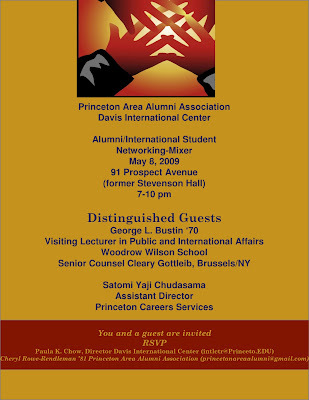 If you consider attending, please RSVP by May 6 to me at princetonareaalumni@gmail.com. On April 14th, 2009, about 30 graduate alumni joined graduate students and SEAS faculty for the annual Princeton Engineering Graduate Student - Alumni Reception. The purpose of this reception was to let the SEAS graduate school alumni share their work experience with current graduate students to guide them in a choice of a career. Alumni also had a chance to identify possible Ph.D. and Masters level candidates for open positions at their company. This event was very timely considering the economic conditions this year. At the fourth PA3 volunteer day at Isles on April 18, a crew of about 25 area alums, family members and friends broke into groups to finish deconstructing a room, scrape and paint walls, disassemble pallets, and sort debris for recycling. Isles founder and president Marty Johnson '81 also gave everyone a tour of the amazing facility. Enthusiasm continues unabated, and more PA3 volunteer opportunities at Isles are planned. PA3's Community Service Committee coordinated a gathering on April 15 to plan a college mentoring project in conjunction with ReachOut 56-81. 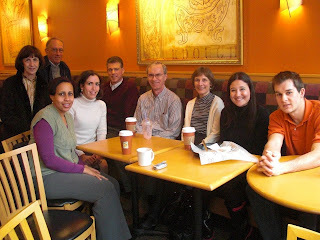 Participants were Anna May Feige '75, Ken Snedeker '56, Grace Penn '99, Sarah Williams Graham '03, Jon Wonnell '81, Tom Hastings '79, Arlen Hastings '80, Lori Piranian '06, and Lon Johnson '08. If you'd like to get involved, please email Arlen at hastings@ias.edu. Please join us for the fourth in a series of volunteer days being co-organized by the Community Service Committee of the Princeton Area Alumni Association (PA3) and Isles, Inc., a Trenton-based development organization (www.isles.org) started in 1981 by Marty Johnson '81. 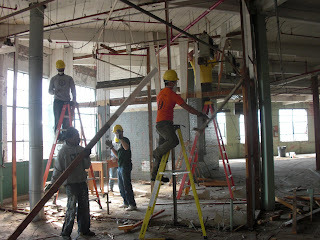 Volunteers will continue working on the renovation of a former textile mill on the Trenton-Hamilton border. The 6.5 acre site is being converted by Isles into a mixed use, "green" village. It will include offices for public interest and environmental organizations, training facilities for inner-city youth, homes, art studios, and other spaces. Alumni, spouses/partners/friends, and children (10 and up) are welcome to participate. There's something for everyone, from the brawny to the scrawny. We look forward to seeing our "regulars" and hope to see lots of first-time volunteers too. No experience needed. The mill is located at One North Johnston Avenue, Hamilton, NJ 08609, about a 12-minute drive from the Princeton campus, just south on Route 1. 25 people have volunteered so far for this Saturday, and there's plenty of room for more. This is a BIG building. PLEASE EMAIL ARLEN HASTINGS '80 (hastings@ias.edu) IF YOU'RE PLANNING TO ATTEND, as we need a head count to ensure we have the right number of supervisors and supplies. Directions, waiver forms, information on lunch plans, and other details will be provided to volunteers closer to the work date. We hope to see you at Isles on April 18!